Behind-the-scenes in Coordinated Internship in Respiratory Therapy (RTH 290). Inside the classroom: In addition to supervised practice in selected health agencies, TCC students who plan to be respiratory therapists gain hands-on experience in labs held in the Regional Health Professions Center. The labs make use of human patient simulators that allow students to practice critical thinking skills in a controlled environment with a patient that mimics real symptoms. 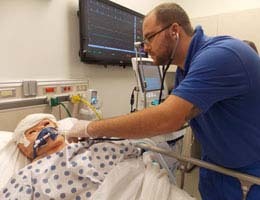 In this exercise, the human patient simulator “Mrs. Johnson” suffered severe head trauma. The students had to control an unexpected seizure and administer an apnea test in addition to keeping her breathing steady. Why this class is fabulous: “For our students, it’s eye-opening to experience things they’ve never done,” said Jennifer Ferguson, program director for respiratory therapy.